Waverly was platted in 1878 by Isaac Pierson, who owned the farm on which the town was located. The first house was erected by A.N. Sylvester. The first store was Thomas Donnell's dry goods, erected in the spring of 1879. The Town Company was chartered in 1880. Fire started in the Finfrocks restaurant at Waverly in 1901 and spread both ways and all the buildings on that side of the street burned. 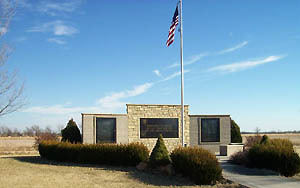 Waverly is located in northeast Coffey County just four miles south of Interstate Highway 35 on State Highway 31, and 20 miles from Burlington. Olive Ann Beach, co-founder of the Beech Aircraft Corporation, was born and raised on a farm south of Waverly.